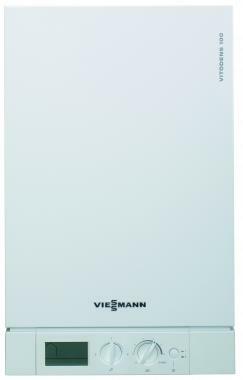 The Viessmann Vitodens range of regular gas boilers (designed for systems with a separate hot water tank) comes in 5 power outputs so there is enough options here to meet most hot water requirements. Unlike combis boiler which heat water directly from the mains a regular system is often a better option for properties with multiple bathrooms. The 35kW version should meet the needs of a large four or five bedroom property but there is a 13kW version which would suit a one bedroom flat. Its reasonable compact and measures 60x38x35cm but requires at least 70cm front clearance for servicing. As with most boilers the addition of further external controls on radiators and room thermostats will allow you to maximise your boilers efficiency your installer will advise on what is best for your property. All Vaillant boilers are recommended by the Energy Savings Trust.